Straight from Japan comes this robot called “Metallic Vaio 2012,” which has a style of locomotion that we’ve never seen before. 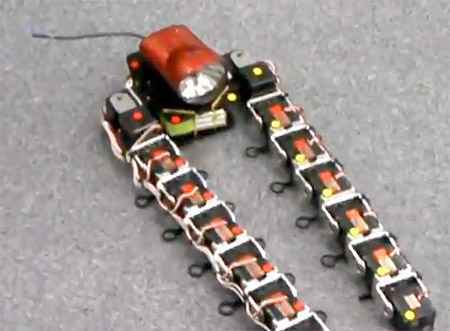 Instead of using arms or legs, it’s got a sort of combination of both: two long tentacles made out of chains of servos that it uses to crawl around and rapidly somersault from place to place. This robot was built (or should we say invented) by Eiichiro Morinaga, the guy who founded the ROBO-ONE bipedal humanoid competition. Besides its name, we know that it apparently has 18 degrees of freedom, and that it was designed to compete in the 6th KONDO LAND Multi-Legged Robot Obstacle Race, where it took second place. While Metallic Vaio 2012 may not be the most efficient of robots, Morinaga-san has certainly come up with something unique, and quite capable, by the looks of it. Adding a simple manipulator to the ends of those tentacles, for example, would create a robot that could use all those degrees of freedom to grasp stuff as well as to move, although doing both at once would be a little tricky. One solution might be to just add more tentacles (always a good idea), and sooner or later you’ll end up with that octopus robot you’ve always wanted.